Hi everyone! Today The Impetuous Afflictions Blog Tour stops by Kim Fielding's blog for stop three! Catch the third excerpt from Chapter Two and enter for a chance to win some nifty prizes! The tour has 13 stops. The first 6 stops are a personally guided tour conducted by the man himself, Jonathan Wolfe. The remaining 7 stops will give you the opportunity to meet the brats individually, and in some cases they will have a partner in crime. I heard for the final day, Johnnie has somehow managed to drag Chance along. That should be interesting. Disclaimer: Please note. 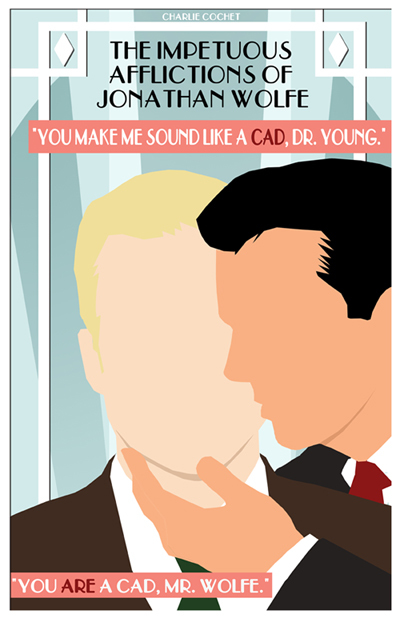 I can't be held responsible for what comes out of Johnnie's mouth. I've been informed he's on his best behavior, but I think we both know that his definition of "best behavior" differs vastly from ours. Here's all the info for the tour you'll need. 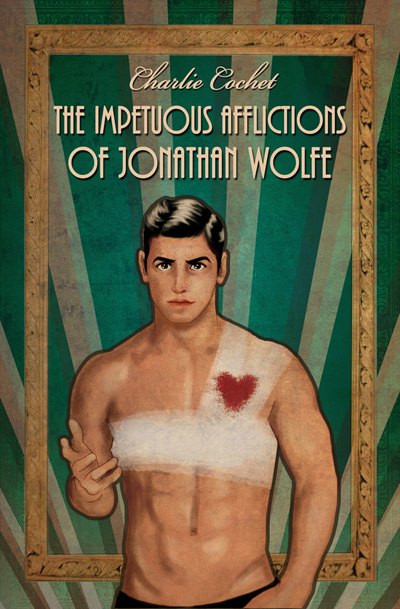 The first stop is The Novel Approach where the lovely Lisa has not only been incredibly kind in letting Johnnie stop by, but has also given The Impetuous Afflictions of Jonathan Wolfe an absolutely wonderful 5 star review!! Just leave a comment on any of the blog posts along the tour, along with a contact email address. **If you would still like to enter the contest but don’t wish to leave your email address in the comment, you can also enter by emailingcharlie@charliecochet.com. 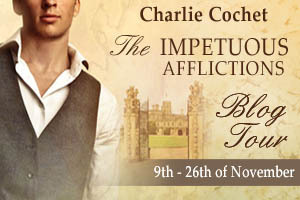 Over at Lex Chase's Blog for Stop Four on The Impetuous Afflictions Blog Tour! Hi everyone! On the fourth stop of The Impetuous Afflictions Blog Tour, we're over at Lex Chase's blog! Join Johnnie as he shares his favorite dessert--no we're not talking about Henry, and catch the fourth excerpt from Chapter Two and enter for a chance to win some nifty prizes! Stop Five of The Impetuous Afflictions Blog Tour over at Andrew Q Gordon's Blog! Hello all! Today is stop five of The Impetuous Afflictions Blog Tour, and we're over at Andrew Q Gordon's Blog! Join Johnnie over at the pub for a pint or several, catch the fifth excerpt from Chapter Two and enter for a chance to win some nifty prizes! The Impetuous Afflictions Blog Tour: Stop 6 with Eden Winters! Hi all! Today is stop six of The Impetuous Afflictions Blog Tour, and we're over at the blog of Eden Winters! Join Johnnie on his trip to London as we meet "the furry hat man" and more! Catch the sixth excerpt from Chapter Two and enter for a chance to win some nifty prizes! Stop 7 on The Impetuous Afflictions Blog Tour over at Michael Rupured's Blog! Hi everyone! Join Gideon Brooks today for stop seven of The Impetuous Afflictions Blog Tour, over at Michael Rupured's blog! Learn a little about Gideon and how he feels about Johnnie and the rest of the fellas at the manor. Catch the seventh excerpt from Chapter Two and enter for a chance to win some nifty prizes! Stop 8 on the Impetuous Afflictions Blog Tour over at Shira Anthony's Blog! Hi all! Today we're over at Shira Anthony's Blog stop 8 of The Impetuous Afflictions Blog Tour! Meet Rori as he chats to you about Aubrey, Chance, and his love of Hollywood! Catch the 8th excerpt from Chapter Two and enter for a chance to win some nifty prizes! The Impetuous Afflictions Blog Tour stop 9 over at Attention is Arbitrary! Hi all! Today is stop 9 of The Impetuous Afflictions Blog Tour and we're over at Attention is Arbitrary! Aubrey's a little shy so Rori has gone along with him. Drop by to see what Rori has to say about his best friend and catch the 9th excerpt from Chapter Two. Remember to leave a comment for a chance to win some nifty prizes!